(Newser) – Survivors may still be picking up the pieces after the natural disasters that have swept across the country over the past couple of years, and now they have a new issue to contend with: the possibility of identity theft thanks to what the Federal Emergency Management Agency is calling a "major privacy incident." BuzzFeed reports on findings by the Department of Homeland Security's Office of Inspector General, released Friday, that indicate personal data on 2.3 million disaster survivors, including banking details, was shared by FEMA with a housing contractor. 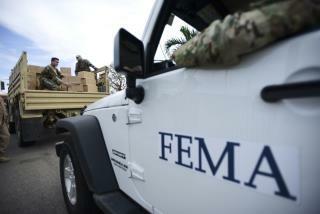 FEMA is now doing damage control, saying it used "aggressive measures" to remedy the problem once it was discovered. A DHS official tells the Washington Post it may have been up to 2.5 million people affected. This is why we need to get rid of the federal government. Unlike private companies, the ... oh, wait. Never mind. Wouldn't bother me one bit. I dumped all my debt in bankruptcy court once The Orange Scumbag was elected. I wanted to make sure I could "help out!"